Event timing: 2 pm to 10 pm. India’s First International Children’s Festival, curates’ experiences for the 0-3, 4-7 & 8-14 age groups and their families. 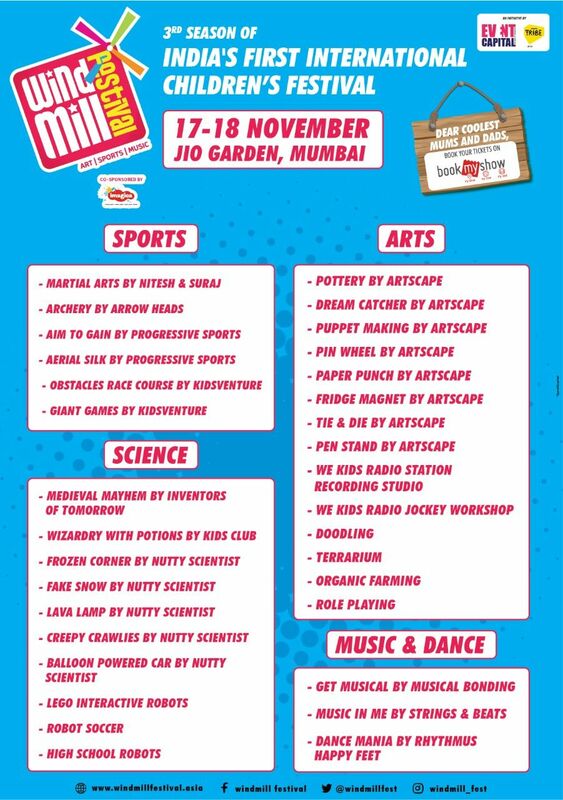 The key objective of the festival is to give the urban child an outlet to be creative, gain information and get a recreational experience along with an avenue to spend quality time with their parents and friends in an outdoor setting. Tickets are strictly limited and subject to availability. Tickets of all types are limited in number, sold on a first-come-first-served basis. Children at the age of 2 years or under 2 years accompanied by an adult will be free, the child must be born on or after 17th November 2016. A physical ticket will be issued at the venue box office on the day of the event in exchange for your e-ticket purchase confirmation from Bookmyshow. Please carry valid photo ID for verification of the ticket holder's name along with your e-ticket print out. A ticket shall not be a valid ticket if the barcode or hologram has been tampered with. Tickets once sold cannot be refunded. The Windmill Festival will have workshops to choose from. Participation for the workshops will be on a first come first served basis only. On full capacity, the attendant will take in a booking for the next sessions. Each workshop will host between 10 – 15 numbers of participants at max. Material and other resources for the workshops will be provided by the festival organizer. The timings for the workshops will be announced on the day of the event and the duration will vary from 30 – 60 mins. Patrons will have to enroll for the workshops on the day of the event and slots will be allotted. Slots will be strictly allotted on the basis of availability. This is a wrist-band access festival. In case wrist-bands are taken off, a replacement wrist-band will not be issued. Wristbands removed or tampered with will be rendered invalid and WILL NOT be replaced. There is no admission without a valid ticket The Festival is not obliged to replace lost or stolen tickets. The Festival reserves the right to vary the advertised program and/or artists. All patrons require a ticket. The Festival organizers reserve the right to refuse entry and/or evict anyone without a valid ticket. Organizers are not responsible for any negative effects of food items or drinks consumed in the venue by festival guests. Patrons attending the Windmill Festival may be filmed, photographed and recorded for the primary purpose of promoting the Festival. Photographs or recordings may appear on Windmill Festival’s online spaces (including website and social media) and other promotional material. Windmill Festival reserves the right to refuse entry or evict any person from the Festival with reasonable cause. This voucher can be collected at the box office on days of your visit at the Windmill Festival (17th & 18th Nov 2018). To ensure safety as per park rules, every transaction should have a minimum of 1 Adult ticket booked. Applicable for children between the age group of 0 to 14 years. Applicable on the purchase of Regular or Express tickets at Imagica Theme Park. Applicable on bookings are done at www.adlabsimagica.com & not valid on direct walk-ins. Not Valid on Tuesday at Theme Park. Park Rules & Regulations Apply.